Eid is one of the biggest holidays of the Muslim calendar. It commemorates the willingness of Abraham to sacrifice his son, and the miracle of having the ram appear to be sacrificed instead. In the Islamic tradition, the sacrificial son was Ishmael, and the prophet Mohammed traces his lineage back to him, just as in the Christian tradition Jesus traces his lineage back to Issac. Eid is celebrated in most Muslim countries by a sacrifice of various animals, usually sheep, sometimes cows and cockerels as well. For the past several days, I’ve seen dazed-looking flocks of sheep lining the Cairo streets, and known that the date of the Great Sacrifice was coming soon. As a longtime vegetarian, I admit that I looked forward to Eid with no small amount of trepidation. My memories of Eid in Morocco consisted mainly of trying not to step in puddles of bloody rain in the streets of Rabat, and watching kids play catch with severed goat heads before tossing them onto makesihft bonfires on street corners. I’d been on a train that morning, so I’d missed everything to do with the slaughter and only saw a bit of the aftermath. I was torn, this time around, between the desire to experience an “authentic” Egyptian Eid and the desire to stay as far away from slaughtered animals as humanly possible. Though I’d heard that there might be a parade in the morning, the guy who invited me to watch with him never got back to me. So I spent the night before Eid at home with my new flatmates and took their advice: the best way to spend Eid morning is to get so drunk the night before that you sleep through the sounds of the animals screaming. (Don’t worry, mom. I didn’t actually get that drunk). I did sleep through the morning slaughter, but was awakened by the steady pounding sound of cow cadavers being hacked to pieces in the building directly opposite my window. I was relieved to discover, on looking outside, that while the activity was audible it was not visible, and there was no blood running down the road as I remembered from Maroc. The only visible signs of the slaughter from my vantage point were carts of bloody sheepskins driving down the street. A butcher-shop smell was in the air. I went out for lunch with an Egyptian friend, who told me he didn’t like the smell of blood or the taste of sheep meat either, and so didn’t really celebrate the Eid. Like disaffected 20-somethings everywhere, he found spending too much time with his parents at home “boring,” and so we were two of many young adults in the restaurant-cafe, presumably all taking a break from awkward familial conversations at home. It reminded me of nothing so much as the inevitable, desperate cafe run with friends that accompanies almost any holiday visit home in the US, when you’re sick of being asked what you’re doing with your life. Young adults everywhere are the same. In the evening, Lorna and Ellie invited a handful of friends for a small house party–their own take on the celebration of Eid. It was very non-Muslim, in that there were large quantities of alcohol, and no real link to any Eid traditions. Just a few expat women and their spouses (some foreign, some Egyptian), with cocktails and conversation and bellydance tv. All in all, it was the kind of holiday celebrated everywhere by people without their families nearby, or by people faced with huge cultural holidays that are not their own. We find friends and gather, not out of any kind of tradition, but out of a need for companionship and solidarity. That when everyone around us is celebrating in a way that we can’t join, at least we are not alone. It’s not often that a restaurant meal is the central focus of my day, but today was an unusual day. I woke up early to take the public bus from Cairo to Alexandria, and arrived at my hotel a little after noon. I hadn’t slept much and was ravenous, so I decided to dive into my Alexandria experience by heading to the Fish Market, a place that had come highly recommended by multiple Egyptian friends. 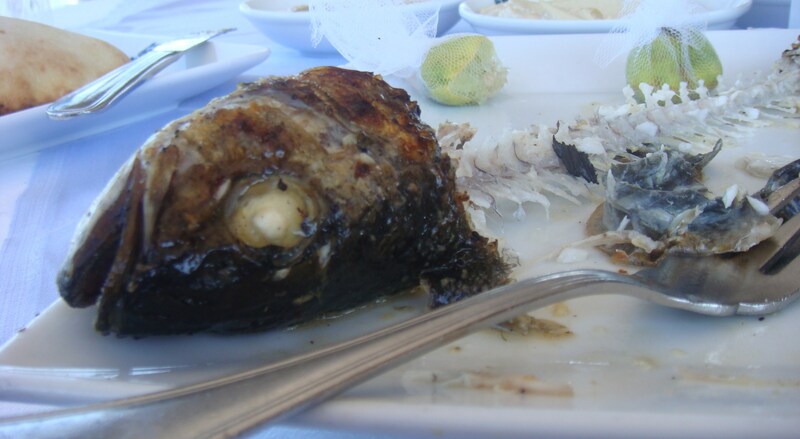 Based on my time in Morocco, I expected a place with a name like “fish market” to be informal: an outdoor extravaganza by the docks where the fish jumps pretty much directly from the boats onto your plate, hitting the grill and some lemon along the way. Noisy, chaotic, full of life and character…this was my expectation. Imagine my surprise, then, after a long, hot walk to get there, that the Fish Market was a formal restaurant, with blue and white tablecloths and big plate glass windows that looked out over the Mediterranean. My first instinct was to go elsewhere: I’d been looking for cheap and local, not formal. But I was hungry, and I’d just walked for half an hour in the hot sun…I sat down. The waiters ushered me to a corner table, set for six, next to huge plate-glass windows with a spectacular view of the sea. Though there was a menu at the Fish Market, it was mostly symbolic. Though it wasn’t the chaotic boatside restaurant of my imagination, it did have the most important similarity: a large display counter, where different kinds of fish and seafood sat half-buried in ice. You could choose your own fish and its method of preparation, and they would bring it to your table made to order. I had a small crisis at the fish counter. Next to each fish was a small sign indicating the price, but said signs were incomplete. Sea bass was 92 Egyptian pounds (about $15). Was this per fish? Per pound? I hadn’t been planning on spending much money, and no helpful English-speakers were in sight, either in terms of staff or other patrons. This meal looked like it might end up being way more than I could really afford for an ordinary lunch. I finally chose a sea bass that looked like it weighed about a pound, figuring that at least that way I would know the approximate price regardless of the system. I didn’t order any side dishes at the fish counter, because I wasn’t sure how much they’d cost, and I didn’t want to end up paying $30 for my meal. When I got back to my table I found a bottle of water and a lavish display of mezze, which I hadn’t ordered. It looked beautiful, but I inwardly sighed. I could already see how this whole meal was going to go–amazing food that I couldn’t refuse at a price I didn’t want to pay. I was tired, I was starving, and I’d been walking in the sun for half an hour after a 3 hour bus ride…I was an easy mark and I knew it. But the mezze looked delicious, and I was too tired to argue and too hungry to think about anything else, so I decided to make the most of my unplanned extravagance and dig in. 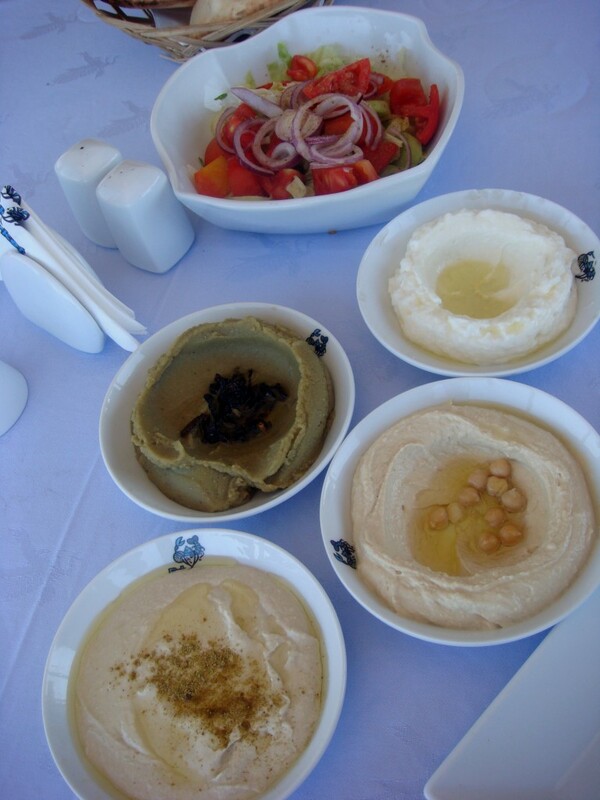 The mezze were excellent, hummus, baba ganoush, a green salad with tomato, and two dishes I’d never seen before, one made from pureed garlic, the other from fava bean paste. Then my fish came, spanning the length of my plate, and though it needed salt and lemon it was very well prepared. Finally, the bill came. 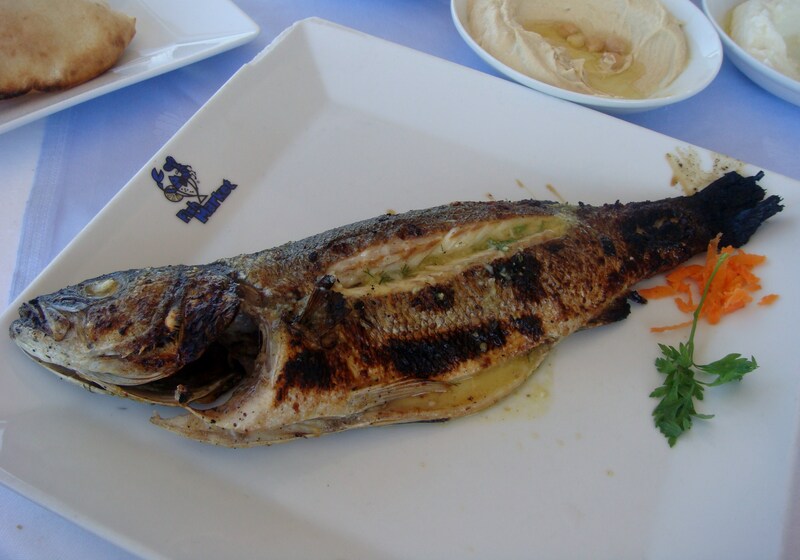 I had already resigned myself to an inflated price, so was incredibly, pleasantly surprised when the total for the fish, mezze, and bottle of water came to just under 70 Egyptian pounds (about $12). The price of the fish was per kilo, not per pound–remember where you are, Laura! The fabulous mezze were only 10 pounds ($2). I felt like an idiot, both for failing to remember the local measurement system, and for being so negative and suspicious that the place was going to rip me off. Every now and then, my jaded traveler expectations are wrong. This was one of those times. So thank you, Fish Market, for exceeding my expectations, and for providing a really excellent meal at a reasonable price. 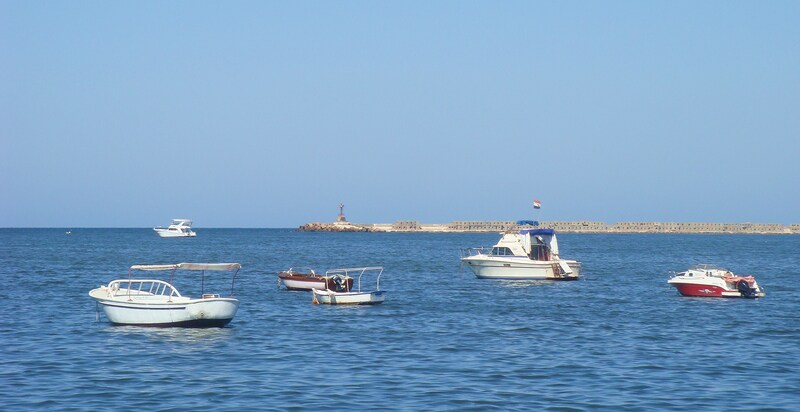 I’m here in Alexandria for several days yet…I will be back. I’m on the Planeterra Blog! Yesterday I wrote up a blog entry for Planeterra, the nonprofit organization that I’m working with while here in Egypt. Check out my write-up on the Planeterra Blog! These past few days I’ve gone out in the evenings, for the first time since coming to Cairo. I found a gym online and got lost trying to get there yesterday, ended up walking around Cairo’s shopping area after dark. Unlike in other cities, where walking around at night is dodgy, Cairo actually felt quite safe. Because of the desert climate, most people don’t go outside in the afternoon. The evening is when the streets become alive. Searching for my gym (which I eventually found and took pilates and zumba classes), I found shops with seasonal sale signs in the windows, a nod to the middle-class consumer culture that was rising in Cairo before the revolution took place. I bought gladiator sandals and a turquoise sundress, and walked around until I found a sushi cafe that proudly advertised its two locations as Cairo and Sao Paulo. More important than the cuisine, though, was that it was a place where I could sit for a few hours with a notebook by the window, without worrying about being heckled by the servers or the passers-by. I realized, as I sat watching Cairo’s easy nightlife pass before me, that I’m beginning to settle here. I’m beginning to get to know the city, not as an Egyptian but as a new expat, and I’m beginning to learn my way around and feel comfortable. Though the city is massive, I’m carving out pockets of familiarity. Slowly but surely, I’m making Cairo into my home.